Meeting between Byron C. Hedblom and Horace W. Corbin Sr.
"I took a night train to Montreal that went through Grand Isle on Lake Champlain where Mr. Corbin lived. He was the owner of the Champlain Transportation Company. This was not a scheduled stop, but he had arranged with the railroad for the train to stop and let me off. I arrived at about 6 AM, it had been snowing all night and the temperature was 20 degrees below zero. There was a chauffeured Lincoln waiting for me, but not another soul in sight. The streets had been plowed for a one-car width and it was about two miles to his house. A path had been shoveled from the street to the front door, a distance of about 500 feet. 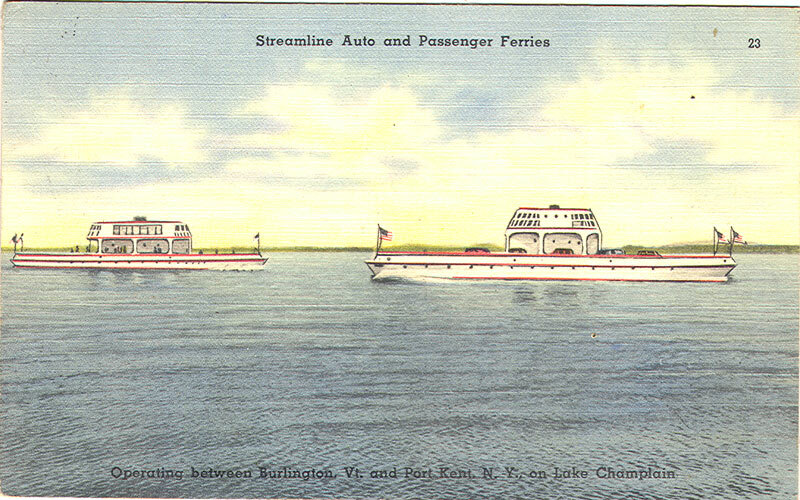 One of the Streamline Ferries: The City of Burlington: Enlarge! I arrived at the house and entered through the front door into a large foyer, where I got out of the heavy clothes and met Mr. Corbin and his wife. She had brought me a pair of slippers so that I could get off my wet shoes. We then went into the living room. This was a huge room about 30 by 50 feet with a high ceiling. In the middle of the wall opposite the entrance was a huge fireplace, about six feet wide with some five-foot logs burning. It sure felt good. We sat for about a half-hour chatting, when Mrs. Corbin announced breakfast. It was a beautiful dining room. We had fried eggs and ham, hot biscuits with honey and coffee with maid service. What a welcome! We spent a whole day going over the plans, discussing our part as well as their part. Mr. Corbin had a group of men who worked the farm during the summer, and were to do the grading and build the launchway and building berth, under our supervision. We had arrived at a rough guess as to what it would cost. Mr. Corbin has already gotten a price for the main engine and a generator. 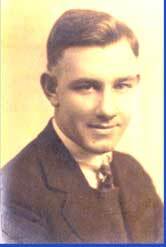 The next day Mr. Corbin asked if I would accompany him to Plattsburg, New York to the bank, which was going to help finance the job. I called Doris [Doris Hedblom, Byron's wife] in Boston and asked her to tell my father that it would probably be two more days. She didn’t much like this, as she was alone with the baby in a large old colonial house that we had recently moved into. The next morning we left for Plattsburg in the Lincoln. We were driving along a lakeside road when the chauffeur suddenly turned off the road onto sort of an entry to the lake. Mr. Corbin said to the chauffeur “ are you ready to go across” the chauffeur said “yes sir”. Mr. Corbin turned to me and said “ you don’t mind do you, it’s perfectly safe. I don’t remember what I answered. We drove down onto the ice and proceeded across the lake, about 10 miles or more. I noticed that the chauffeur had his car door opened, which didn’t make me feel any better. We spent about four hours in the bank, had some sandwiches and coffee for lunch and headed back to Grand Isle. We had a delicious dinner that evening where I met Mr. Corbin’s foreman who was a big woodsman. They had cocktails, which I didn’t have. Mrs. Corbin asked the foreman what he would have and he responded “oh, my usual I guess. The maid brought a shot glass and a bottle of whisky. He poured the glass full and downed it in one gulp. They left the whisky bottle on the table and he helped himself to another shot at the end of dinner. After dinner we sat in the living room, Mr. Corbin, the foreman and myself. Mr. Corbin offered cigars, which I refused but the foreman took one. Mr. Corbin didn’t smoke. We discussed what was involved for the launch ways and the building berth blocking, shoring and the sliding ways and the cradle. I made some sketches of this work. The foreman saw no problems with this. Mr. Corbin said we would go to Burlington in the morning and look at the building site and also the location of the dock and roadway to the dock. There was also a railroad siding. Mr. Corbin said he would build the ramp for boarding the ferry. I didn’t pay much attention to this but it fell to us to build a ramp about 30 feet long, which could be raised and lowered for the different lake levels. It also had to be made to fit the ferry ends. We had to make one for each end of the ferry trip, an extra expense of course. "